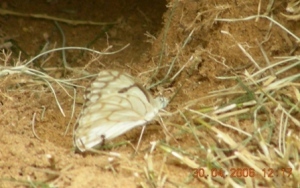 One doesn't quite expect to find butterflies in the desert but they were present alright. The common danaids were present since their food plant the Aak or Calotropis was present in my garden. Every day I saw tiny blues which I discovered to be the Dark Grass Blue. There was also a Pioneer which stayed awhile and moved on. Insect life must exist in greater variety than one expects in small pockets in the desert as I also saw a wasp meticulously scour the garden presumably for caterpillars. 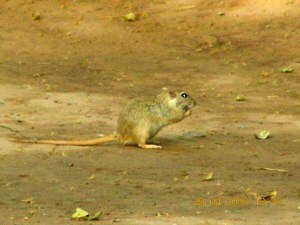 The star of the garden is, of course, the jird. Most people call him 'gerbille' or 'kangaroo mouse'; he is neither. His short, rounded ears, chubby body, long thinly haired tail with dark tassel, and shorter legs than one would expect of a mouse looking like a miniature kangaroo, he is the cutest of desert creatures in my garden. One day he turned up in my newly developed garden strolling in as if he owned the place. This was followed by a detailed reconnaissance on his part which culminated with the selection of a spot by the gate where there was adequate shade available. He then proceeded to dig as swiftly, continuously and urgently as he could, realising the risk he faced of being without a bolt-hole. Every few minutes or so, whenever he felt unsafe or uneasy, he would pause and sit upright, facing this way and later that, till he was certain danger had passed. Then he would resume with renewed vigour. Sometimes his head was not seen as it was buried deep but the rear part of his body and his feet were rapidly jerking upwards above the ground level ejecting a constant stream of sand from the hole. Finally, the burrow was done but it was becoming dark. Tired but satisfied, he went to have a sip in the newly installed water-bowl but instead sat up at the edge and shrieked angrily. 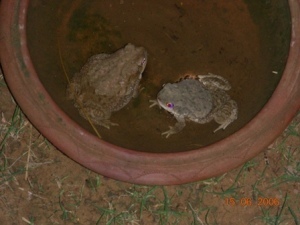 Peering to see what was the problem, I espied Mr and Mrs Todarmal stolidly sitting in the water. 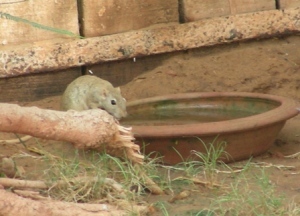 Only after I had driven off the indignant toads and changed the water, and also hidden myself in the verandah, would the jird take his sip of water. Now, master of all he surveys, he shows himself during the day only when it is not too hot. Then he emerges from his burrow, does his personal grooming and then clambers up the side of the bowl to drink his water. Thirst satisfied, he seeks to satisfy his palate. This he does by raiding the bird-seed spilled over the edge of the feeder tray or by nibbling pieces of grass sitting outside his burrow. Should another jird enter the garden, there is a thorough free-for-all until he has vanquished the interloper. 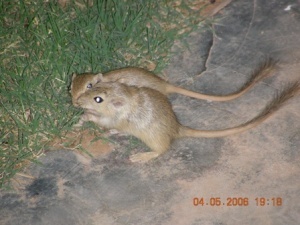 One day I saw another slightly smaller jird and realised he had a mate. But alas, I was not fortunate enough to see their progeny as the authorities cottoned onto the fact that I was enjoying myself thoroughly and decided to remedy the fact by posting me to the North East. Though I am no longer physically present in the desert, in my mind's eye I can still return to enjoy those pleasurable moments that were once my good fortune to experience.